Ernesto "Che" Guevara was an Argentine Marxist revolutionary, physician, author, guerrilla leader, diplomat, and military theorist. A major figure of the Cuban Revolution, his stylized visage has become a ubiquitous countercultural symbol of rebellion and global insignia in popular culture. 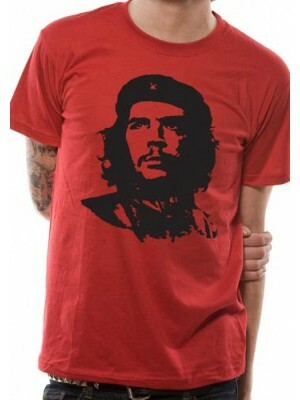 CHE GUEVARA T-Shirts which we offer at Plain-t-shirts.co.uk forms part of our movie, games and music official merchandise range. CHE GUEVARA range we offer fast delivery all over UK/EU CHE GUEVARA - RED FACE (UNISEX) which we offer which you can have..
As a young medical student, Guevara traveled throughout South America and was radicalized by the poverty, hunger, and disease he witnessed. His burgeoning desire to help overturn what he saw as the capitalist exploitation of Latin America by the United States prompted his involvement in Guatemala's social reforms under President Jacobo Árbenz, whose eventual CIA-assisted overthrow at the behest of the United Fruit Company solidified Guevara's political ideology.